Update (Jun 2011) : For more updated info, check out my ADC article here. 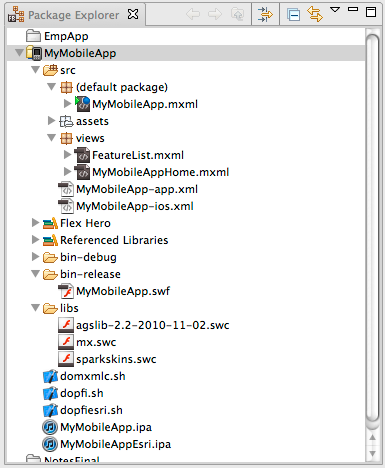 At MAX2010 (Awesome BTW) Adobe introduced Flex SDK Hero and Flash Builder Burrito which enables you to build and deploy Flex mobile applications on Android by default. In addition, using the revitalized Packager for iPhone, you can postprocess the swf into an ipa that you can deploy on an iPhone using iTunes. In this post, I will share with you the steps that I took to use the Flex API for ArcGIS to build a mobile mapping application. The cool part of this whole process is now you have one code base to build upon and deploy on Android and iPhone and in the future whatever mobile platform Adobe decides to support. You can download the source code of the sample application from here. This simple application queries the states demographic layer in arcgis.com and displays the result as a list. By taking advantage of the new state syntax in Flex 4, if the user rotates the phone to view the info in landscape mode, the list is replaced with a map showing the selected states. Cool ? There is no new Flex API for ArcGIS to learn. I'm using the same old Query, QueryTask, Map, ArcGISTiledLayer, GraphicLayer and SimpleFillSymbol classes from the released Flex API. 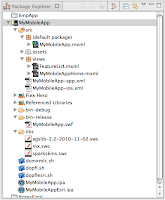 Now you can compile, deploy and run your swf on the USB attached Android. Make sure that you have the latest AIR runtime on your phone. If not, then delete AIR using the Settings view and redeploy the application, the latest runtime engine will be automagically installed. Again - if you want to know what all the above options mean - you _must_ read the packager documentation. The pfi command will run for a long time - do not worry - it will eventually finish - again, this is still in its early stages, and I hope that Adobe will make this easier and faster in the future. Now drag the ipa file onto iTunes and sync your iPhone. you should in theory have the app on your iPhone. I hope this works for you and tell me what you think.